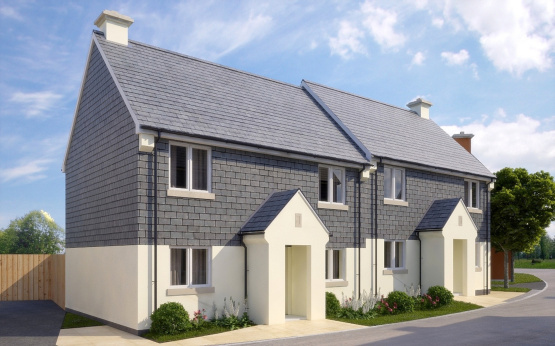 Local homebuilder Cavanna Homes has launched its latest development Offshore, in the picturesque South Hams village of Stoke Fleming, within walking distance of award winning Blackpool Sands which is widely acknowledged as one of the finest beaches in the UK. Set within an area of Outstanding Natural Beauty, this chic coastal retreat is a small development of just 24, three and four bedroom new homes, including a mix of detached and semi-detached properties, in a traditional style, finished with slate or render. The Torquay-based homebuilder’s newest development is close to the village’s local amenities and is just a short distance from Dartmouth, known for its rich maritime history and cobbled streets full of independent shops, restaurants and bars. All properties at Offshore come complete with a 10 year NHBC Buildmark Warranty and subject to the stage at which a property is reserved, buyers have the opportunity to select their kitchens and bathroom wall tiles. It is this attention to detail and level of aftercare, that has earned Cavanna Homes a maximum five stars in the prestigious Home Builders Federation customer satisfaction awards, four years in a row. Andrew Biggs Land & New Homes Manager at Marchand Petit, the agents handling the development on behalf of Cavanna, said he is delighted to be involved with the scheme of such quality houses in the unique location of Stoke Fleming, which has so much to offer within the village as well as being within walking distance of wonderful beaches and coastal paths. The properties themselves, a mix of 3 and 4 bedroom homes, offer parking and many have garages and rural views, please visit www.marchandpetit.co.uk for further information.